A crown is a structure that protects a damaged tooth from further deterioration. It is affixed to an implant (an artificial tooth root) when a lost tooth is replaced; the crown is the visible part of the tooth. 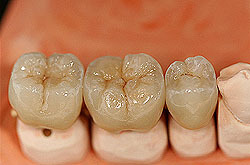 When selecting a crown or bridge, factors of load and aesthetics are considered. In a conventional dental procedure, the teeth next to one or two empty sockets are chiselled, and the missing teeth are replaced with a three- or four-part bridge. If the neighbouring teeth (the so-called pillar teeth) are in a poor condition, then this is the perfect solution because not only are the missing teeth replaced, but the neighbouring damaged teeth are also protected. Crowns and bridges are made of various materials. Zirconium-oxide is a material used for making non-metallic tooth crowns and bridges. They are aesthetically advantageous as, due to the lack of metal content, the crown or bridge reflects light very similarly to natural teeth. Metal-containing parts always look more “lifeless”. 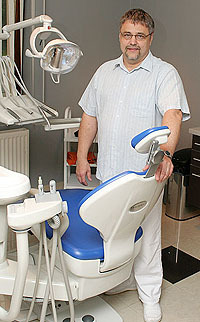 A zirconium crown is made based on an accurate denture impression, so it fits perfectly. A zirconium crown can be used even in extreme cases of metal allergy. Another very important advantage of the material is that it causes no allergic reaction even in extreme cases of metal allergy. Some crowns and bridges are covered with porcelain but are mostly made of metal. The metal frame ensures stability, while the porcelain coverage gives the tooth a natural and pleasing look. Metal crowns take less time to make than part entirely made of porcelain. This is one of the best-looking and safe, long-term treatment of decayed or broken teeth. To put it simply, this is a technical filling method. The decayed or damaged part of the tooth is removed, and then a dental technician prepares the “filling” (made of porcelain or gold, in the colour of the tooth) based on an impression. This filling or inlay is affixed with a special glue. This is an excellent solution to treat decayed molars and broken teeth; in this latter case, it can eliminate the need for a crown. It is advisable to have your old amalgam fillings replaced with white fillings. The material hardens upon illumination, and its colour matches that of the tooth. These fillings can be used in any tooth type, in case of minor decays. 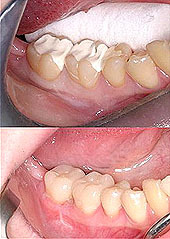 Groove closing goes a long way toward preventing the decay of children’s teeth. Filling up the deeper grooves in molars can slow down or prevent subsequent tooth decay. Beneath the hard tooth tissues, there is dental pulp that contains veins, nerves, and connecting tissue. Root treatment is usually required by an internal inflammation called pulpitis, caused by deep cavities. When this occurs, bacteria proliferate in the tooth channel and its wall. During the treatment, the infected content and tooth channel wall are removed, the space is sterilised as much as possible, and the entire root channel is filled with a material that ensures the lasting closing of the channel.